1910 Eton college - won a Divinty prize and excelled at cricket, rugby and rowing, winning House colours in the latter. c 1919 He studied at Christ Church at the University of Oxford, where he graduated in Oriental Languages. He was fluent in French, German and Persian, and also spoke Russian and Arabic. 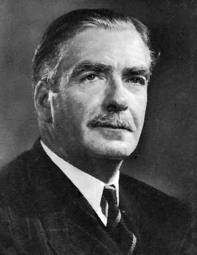 1939 On the outbreak of war, Eden, who had briefly rejoined the army with the rank of major, returned to Chamberlain's government as Secretary of State for Dominion Affairs, but was not in the War Cabinet. As a result, he was not a candidate for the Premiership when Chamberlain resigned after Germany invaded France in May 1940 and Churchill became Prime Minister. Churchill appointed Eden Secretary of State for War.